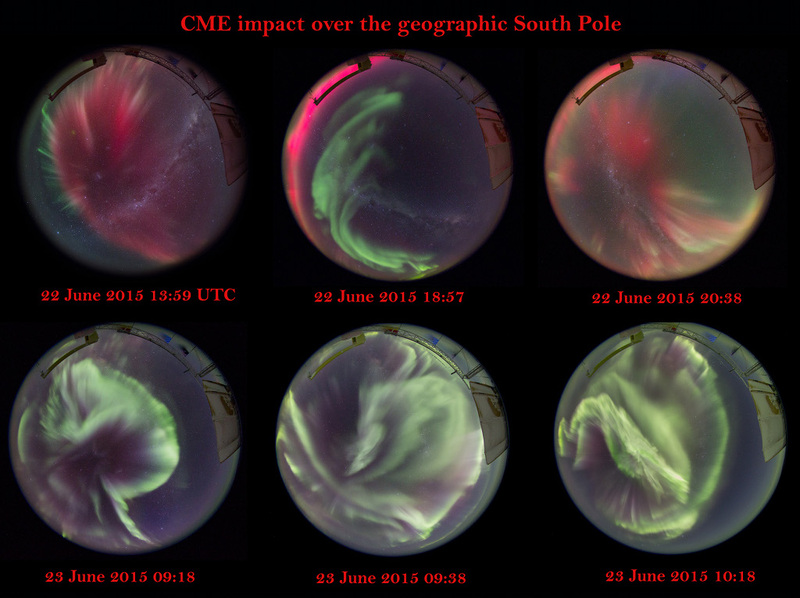 Explanation: Not fireworks, these intense shimmering lights still danced across Earth's night skies late last month, seen here above the planet's geographic south pole. The stunning auroral displays were triggered as a coronal mass ejection blasted from the Sun days earlier impacted the magnetosphere, beginning a widespread geomagnetic storm. The six fisheye panels were recorded with digital camera and battery in a heated box to guard against -90 degree F ambient temperatures of the long winter night. Around the horizon are south pole astronomical observatories, while beyond the Aurora Australis stretch the stars of the southern Milky Way.